Few cars stand unopposed in their market segment. For those looking for an inexpensive, reliable, purpose-built sports car with the engine in the front, drive wheels in back, truly spectacular handling, and can only have one car the Internet Meme Machine is quick to point out, the answer is always Miata. In 1990 the small Roadster was set upon the world in a US-first release available only in the appropriate red, white, and blue hues. 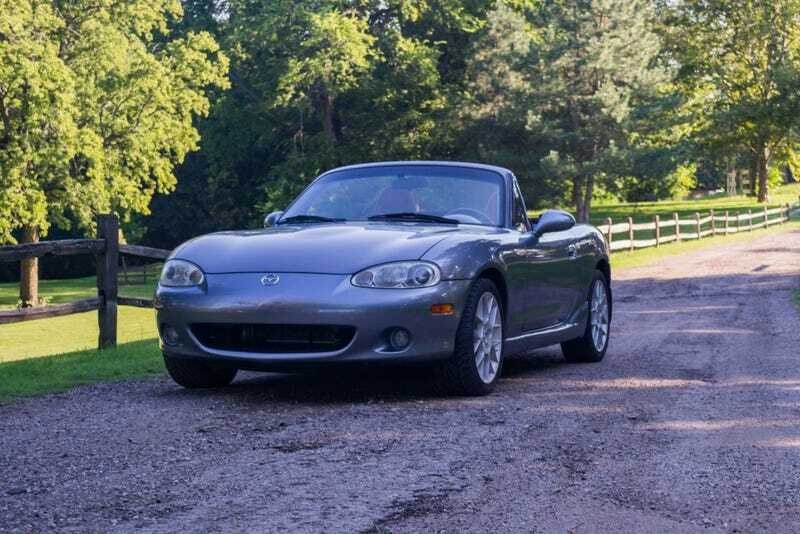 12 years later the Miata was well into its second generation and coinciding with a mild refresh is a new version of the ongoing series of Special Edition Miatas. 1491 Titanium Grey and 1000 Vivid Yellow ‘02 SE Miatas were ever made, with a Torsen LSD, Nardi steering wheel, Bose audio, unique gauge faces, and two color choices (Grey/saddle brown leather interior or yellow/black leather interior). This article has been Kinja’d! To read it in its original glory, head on over to fastnotloud.com! The second generation Miata eschews the soapbar styling of the original and instead adopts a most sculpted, muscular look. The entire body has been widened with more pronounced “hips”, and an overall more bubbly style has been draped over a very similar chassis to the older car. Pop-up headlights are left behind in the 90s and replaced with fixed plastic units for pedestrian safety reasons. The facelift added some additional creases in the front bumper, as well as projector lowbeam headlights. The Special Edition Miata gains a plastic bodykit jokingly referred to as “tupperware” by Miata enthusiasts, and unique 205-width 16-inch 7 spoke (or 14 spoke, depending on how you look at it) wheels. The more complex special edition wheels give the roadster a more premium appearance that is muddied somewhat by the take-it-or-leave-it side cladding. Around back the theme of increased sculpting continues. The bumper gains an indentation, the trunk lid has a mild ducktail on it, and the SE gets a plastic spoiler. Interestingly the “finish panel”— the area between the tail lights— is now integrated into the bumper instead of being a separate body piece. The Miata is not a luxury car. It is a cheap roadster for the masses, and accessible way to get an excellent driving experience on a budget. That being said, the interior of a 2002 Miata SE is very much not a bad place to be. The chocolatey brown leather that adorns the seats and steering wheels is a lovely choice, with the theme continued onto accent panels on the door cards. The steering wheel, made by Italian auto firm Nardi, is perfectly sized for both spirited driving and lazily cruising along. Radio and HVAC controls fall easily to hand as does the 6 speed shift lever and center-mounted power window switches. All touch surfaces feel surprisingly premium, with the illusion finished off with chrome rings around the gauges and the very nice brushed metal pedals. In a very notable improvement, not just for the Miata but for stick-shift sports cars in general, the cup holders are staggered so that the front one is closer to the passenger, allowing for drinks to occupy both cup holders without interfering with operation of the transmission. All is not perfect, however. The NB Miata loses interior volume compared to the NA due to packaging restrictions and crash safety requirements. Even at a mere 5'6" I find myself feeling rather large in the Miata’s driver seat. The seats themselves are rather hard and the bolsters, possibly for reasons of the ever-growing median American, are too far apart to hold my lithe frame in place securely. Fairly minor gripes for which your mileage may vary, but worth mention. Of course, handling and looks aren’t the bread and butter of the Miata. Above all else the Miata is known for its handling. It’s a lightweight, tossable car with near-50/50 weight distribution that allows for a controllable, eager experience. The first generation Miata’s facelift added numerous underbody braces, and the second generation increased chassis stiffness. With the second generation facelift the chassis was stiffened even further, with the SE gaining a front strut brace on top of it all. Unlike the NA6, the NB2 SE feels solid and yet compliant. Bumps are pronounced without being jarring, and the car playfully dives and bobs along with a road’s surface. Bump steer was, I noticed, rather significant with the 205-width rubber wrapped around those gorgeous wheels, but the power steering made it easy to keep under control. Of course, the true reason the Miata is so adept in the twisties is primarily owed to its light weight. Specced as it is, the curb weight of an ‘02 SE is just 2350 lbs. Body roll is present but from the perspective of the driver is completely invisible as the car pivots around the seats carving joyous slice after slice out of the countryside as it bounds from corner to corner with aplomb. For those with naughtier tendencies, the Torsen limited-slip differential makes stepping the tail out a reasonably trouble-free affair. Even under moderate city driving conditions my SE has been known to chirp the rear tires while pulling away on a right turn. The venerable BP series of engines continues with the BP-Z3 that debuted in the Miata in 2001. This version removed the variable length intake runners, instead adding restrictors for cold-start emissions purposes and adding intake-side variable valve timing. This combination squeezes 142 horsepower out of the 1.8 four-banger and attains 28mpg highway. The engine is smooth and loves to rev, never feeling stressed or overworked. The 6 speed manual is available in lieu of a 5 speed on the SE, however highway revs (and therefore fuel economy) are unchanged and, puzzlingly, 0-60 times are unchanged between the two transmissions, so the only advantage of the 6 speed is more fun gear-changing while driving. I did find the experience to be somewhat lacking compared to the 5 speed found in an NA, and the clutch had a vague, mushy feel to it that I find altogether unbecoming for such a driver-focused car. The elephant in the room, of course, is the acceleration of the Miata. 0-60 happens somewhere between doesn’t matter and who cares seconds. I say this because the Miata was developed not for the ramrod-straight Midwest US roads that I live on, but it was designed in California for Mazda in Japan for twisty mountain roads and tearing up Highway 101 on the Pacific coast. It’s an engine designed to propel the car along adequately. A Mazda Miata doesn’t accelerate. The Miata’s ability to out-handle so many other cars on the road mean it can carry far more speed through the corners, offsetting the lack of straight-line grunt. As an aside, the engine is thus understressed compared to, say, the balls-to-the-wall 2-liter in the Honda S2000. This increases reliability, which keeps down operating costs, making the Miata a better value proposition. The exhaust note of a 2002 Miata SE exists. That’s the long and short of it. In stock form it is an unoffensive buzz that eagerly rises with the revs, never sounding stressed or wound out. There is no rasp, no asthmatic wheezing, just a reassuring hum to remind you there is an engine present and accounted for. For car audio the Miata SE gets two door speakers and two tweeters powered by a Bose head unit and amplifier. This particular model has the 6 disc CD changer and tape deck. A “top up” and “top down” speed-sensitive volume system is in place and adjusts loudness (applying a “smiley” equalizer curve in varying degrees of severity as well as volume) to keep music audible and, actually, sounding quite nice even at 65mph with the top down. For extra “bling” the Miata has a power antennae that slowly extends and retracts as you gleefully mash the radio power button, trying to recapture the charm of the pop-up headlights from the NA. Finding faults with the Miata is difficult. The car is such a well-balanced package it’s hard to find reasons to take points off other than other things are better at that specific thing. Most cars will beat it in acceleration, any number of high-end sports cars will out-handle it, and even a base model Mercedes will be nicer on the inside. But as a car, taking it for what it is, it’s not difficult to see how so many people have fallen for these roadsters, and why they have attained internet-meme status as “always the answer”. For more reviews like this and articles written by myself and others please check us out at fastnotloud.com or our Youtube channel Drive Fast Not Loud.